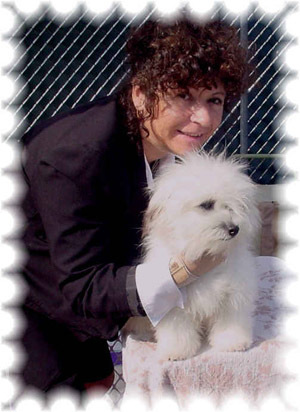 COTON DE TULEAR BREEDER SINCE 1994!! ARIZONA’S FIRST AND NUMBER ONE COTON BREEDER. ALL FOR THE LOVE OF THE BREED. It all begins with being passionate and loving for a particular breed…. For me it is the Coton De Tulear. I keep an open mind and I am always ready and willing to learn anything that will help me be a better Coton De Tulear Mom – Breeder – Groomer –Trainer. Breeding following the FCI and UKC Standard as our guideline is necessary to help better a breed. I enjoy attending seminars, dog shows, being involved with the breed club and working with other breeders. Reading and studying the structure, movement, health, and behavior of dogs will always interest me. I want to know all the new techniques, new tests, Any thing new that is Dog – Cat – Horse related…I am an Animal Lover at heart… just born that way for sure!! And then, I found the Coton De Tulear . Coton Love!! I am able to see each dog for what they are ….their faults and their attributes. I believe that Good Temperaments is the most important issue in my breeding program.Good Temperaments should be the most important issue for every breeder…. As people will always be able to take care of a dog that may not be show-breeder quality…May have a funky looking ear… May have health issues….. But a dog that cannot be trusted…. Is a big problem. Health testing for known health problems especially if closely related to my bloodlines is a must and Cotons with any health issues should not be bred!!! We breed the Coton De Tulear to Better the Breed…. With understanding the responsibility and obligation of every puppy we produce and place. We Care! !